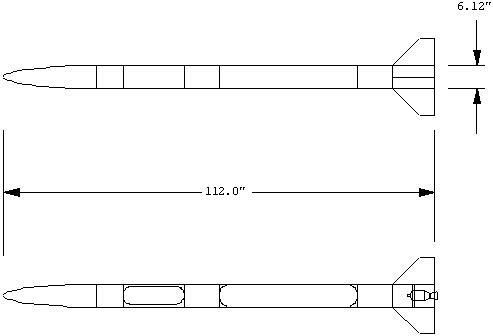 The vehicle was six inches in diameter and a total of 112 inches in length (Figure 1); of this, 24 inches were accounted for by the nose fairing, an additional seven inches of cylindrical section below the nose constituted the payload accommodations. The rocket itself was thus 81 inches in length. The vehicle made use of a High Pressure Tank filled with Helium at 4500 psia (Luxfer T-27A rated for 3000 psia with a safety factor of 3.3 at that pressure). This fed through a Grove Mity Mite regulator that was set (for flight) to provide 510 psia to the propellant tank (See Figure 2). Filling of the High Pressure tank was via a quick-disconnect fitting that was pneumatically operated on the groundside to allow automatic filling of the tank from the Blockhouse. During pressurization, gas was allowed to flow though the regulator and pressurize the propellant tank. Downstream of the regulator the pressure system contained a tap that ran down the side of the rocket via a utility tunnel to the main propellant valve, which was pneumatically actuated. 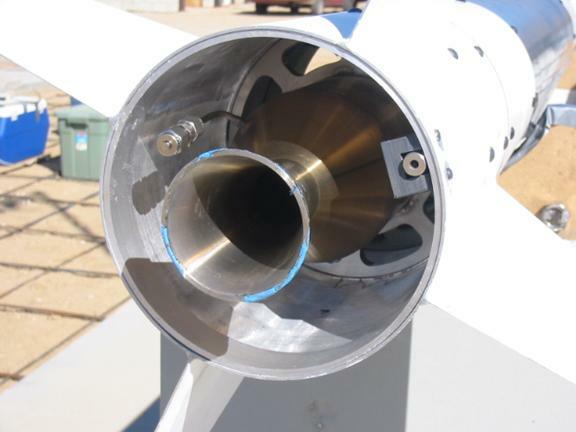 A check valve prevented Peroxide vapor from moving upstream and contaminating the regulator; a quick disconnect fitting provided venting for the propellant tank during fueling and served as a “tap” for measuring propellant tank pressure during static tests. From the bottom of the Propellant Tank the propellant fed past a Fill / Drain Valve to the Main Propellant Valve which was, as mentioned, pneumatically actuated. Operation was via loss of pressure to a “reference” port on the side of the valve: so long as the pressure at the reference port was the same as the tank pressure (which was assured by taping the “reference” line from the top of the propellant tank), the Main Valve remained closed under 50 pounds of spring force. Once the pyro-actuated vent valve closed (upstream) and vented (downstream) the Main Valve was forced open by the differential pressure from the Propellant Tank. The internal valve design was a poppet “venturi valve” that served to minimize pressure drop. 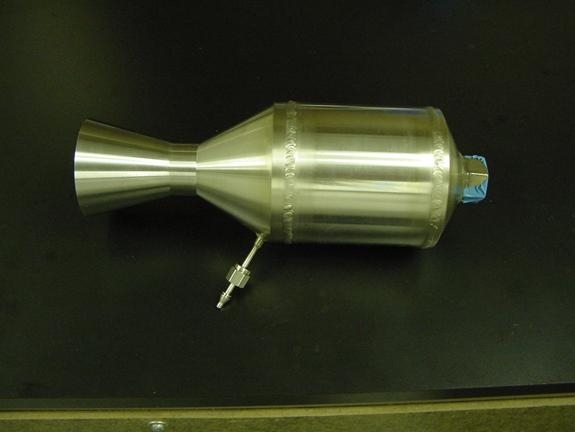 Both the Main Propellant Valve and the associated pyro-valve were designed and built by RRS member Tom Muller. Once opened, fluid flowed through a restrictor orifice to the Motor. The Motor was designed to operate at 400 psia and generate 350 pounds of thrust for about 12 seconds. The operating pressure choice was driven by the wall thickness of the Propellant Tank and estimated pressure losses; thrust was chosen as “somewhat higher” than the 200 pounds thrust of the original 1951 Peroxide rocket to avoid “weather-cocking” due to low velocity leaving the launch tower. Late in the project vehicle weight growth lead to the decision to add a single solid-propellant strap-on motor to boost the vehicle up the tower; a much higher thrust main engine (around 1000 lbsf. for a 4+ second burn time) would also have worked. The vehicle design allowed the hardware to be “built up” out of separate sections. The High Pressure section contained the High Pressure Tank, the 7075 Aluminum Tank Support Structure and associated high-pressure fittings and was sheathed in a filament wound composite airframe. In order to secure the High Pressure Tank within the airframe, an expanded polypropylene cylinder with G-10 fiberglass rings bonded to each end was fitted around the upper section of the High Pressure Tank, thus limiting any movement within the airframe. The section of the vehicle immediately below the High Pressure section was a total of 12 inches in length (including three inches of total overlap—1.5” at each end—with the two adjacent sections) and contained the high pressure (4500 psia) lines for filling the High Pressure Tank and routing the gas to the Regulator as well as the “low pressure” (500 psia) lines downstream of the regulator leading to the Propellant Tank and including the Propellant Tank vent. Because all of these lines and the many connections between them had to be pressure tested for leaks whenever a line was broken, this section had two removable “doors” (each one-half of a cylinder) that were secured via five 10-32 button head machine screws each. Structural support for loads was provided by a piece of filament-wound tubing (“coupler” tubing) with four cutouts to allow access to the interior of the vehicle. The Propellant Tank assembly consisted of a 6.0” outside diameter 6061-T6 aluminum tube 30 inches in length with two hemispherical domes welded to each end; wall thickness was 0.125 inches throughout. After welding the domes to the tank and the attachment bosses to each dome, the entire tank was heat treated to return the material to the –T6 condition and then rolled and stretched back to a true cylinder. Finally, the tank was filled with Liquid Nitrogen and press fit into a hoop wound carbon fiber airframe tube. Eight equally spaced 10-32 clearance holes were drilled at each end of the airframe for attachment to the sections above and below and a 1/8 inch pressure line was routed along the side of the tank from the upper to the lower section; this line was covered with a 1/2” OD carbon fiber half-tube made by splitting a standard piece of kite tubing. Two layers of fiberglass cloth (2” wide and 4” wide) were then layered over the “raceway” to secure it. Large hose clamps were used to hold the raceway assembly in place while the composite cured. RRS member Dave Crisalli oversaw fabrication of the Aluminum Propellant Tank. Below the Propellant Tank a structural section identical to the one above the Propellant Tank was used to provide access to the Fill / Drain Valve (Figure 3) and locate the Fin Can. Figure 3: Fitting up the Fill / Drain Valve and Main Propellant Valve Assembly. Base of Propellant Tank is at Left, Start Pyro-Valve is partially plumbed to the Main Propellant Valve, Fill / Drain Valve in center below the Start Pyro-Valve. The Fin Can was turned from a 6.25” OD and 6.0” ID piece of 6061-T6 tubing to an outside diameter of 6.12”; the four fins were welded to the Fin Can and the ID was then turned to 6.0” (to compensate for weld warping of the cylinder) for a press fit onto the Fill / Drain structural section (Figure 4). The 316L stainless steel motor (Figure 5) was welded together from piece parts after hydraulically pressing the samarium oxide over-coated silver screen catalyst bed together. A thrust takeout structure was welded to the top of the motor assembly (Figure 6) and secured to the fin can via eight 10-32 button head machine screws (this size fastener was used throughout the vehicle). Figure 4: Fin Can and Motor Assembly. Note pull-away power connector to the Start Pyro-valve on right and motor pressure tap on left; thrust take-out structure is visible inside the fin can. The propellant tank was passivated using 50% Nitric Acid with 3% Hydrofluoric Acid for 10 minutes followed by three rinsings with deionized (DI) water; the tank was then filled with 30% Hydrogen Peroxide for one hour followed by rinsing with DI water. Finally, the tank was filled for one hour with 50% H2O2 and rinsed followed by a washing with 90% Peroxide. All valves and lines that would come into contact with Peroxide were disassembled, carefully degreased, rinsed three times in DI water and placed in 30% Peroxide for conditioning before reassembly in clean conditions and bagging in plastic until assembly. During assembly, all openings were capped to minimized contact with the atmosphere. Pressure checking the vehicle for leaks required three days effort. Initial testing was at 100 psia, then at incrementally increasing pressure to 1000 psia (in the high pressure section—the low pressure side was at about 500 psia due to the regulator). Finally, the whole vehicle (less motor) was remotely pressurized to 2500 psia to confirm the system was leak free; this was combined with a water blow-down test to confirm operation of the main valve. Figure 5: 350 lbf. Thrust Hydrogen Peroxide Motor with pressure tap. 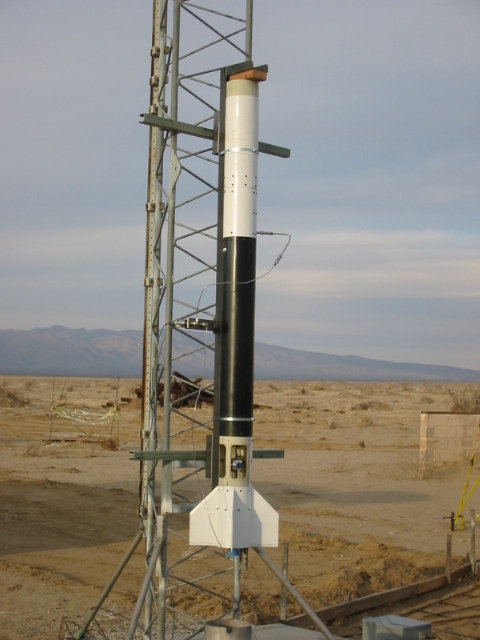 The first static test of the vehicle did not include the fin can (Figure 7); a substitute structure for transmitting thrust loads was therefore used for this test only. 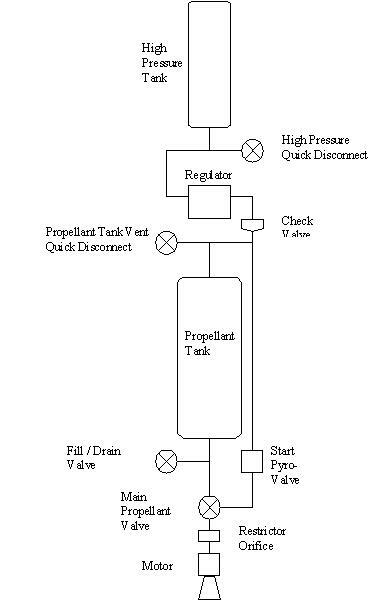 In addition, for this static test a Marotta valve was used to control the Main Propellant Valve for safety reasons. The vehicle was filled with about 1 gallon of 90% Hydrogen Peroxide (a little less than one-half of a tank) and turned on; it ran for about 4 seconds with an obvious high power and low frequency acoustic oscillation. Unfortunately, data from the motor and propellant tank pressure taps did not record due to a still undetermined fault in the test setup. Nonetheless, it was obvious that a restrictor orifice was required to damp the acoustic coupling between the motor and the vehicle propellant feed system; in addition, it was concluded that the original location of the check valve in the “low” pressure system might be causing a feedback though the Main Valve control tap and so the location of this valve was moved to assure that the pressure sensed at the Main Valve port was the same as the Propellant Tank pressure. Figure 6: Motor Thrust Take-out Structure. Following rebuilding of the pressure section and updating the vehicle to flight configuration, a second static test was conducted. Again, about 1 gallon of Peroxide was used; unlike the previous test, a flight-configured pyro-valve was used to control the main valve. Unfortunately, the lines for connecting the pressure transducers to the test computer were mistakenly left in town (amateur rocketry, indeed) and so the test was run without any data gathering. As before, the rocket started immediately but with a much lower power acoustic oscillation due to the 5/16” restricting orifice inserted in the propellant feed line ahead of the motor. 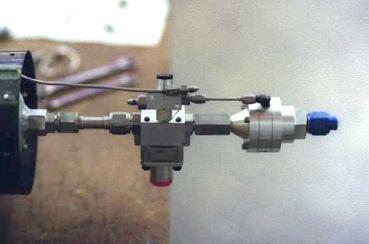 A third static test (Figure 8) with full instrumentation and a slightly modified restricting orifice (the length of the 5/16” orifice was extended to 1” in order to obtain a higher discharge coefficient and thus higher flow through the orifice) and with a measured quantity of propellant indicated that pressure in the propellant tank (and the motor) was low by about 75 psia as compared to the design goal, resulting in motor thrust of about 200-210 lbsf. and an estimated burn time of 21 seconds. This problem was fixed by removing the regulator from the vehicle, measuring its output pressure and increasing that by 85 psia for a calculated increase in chamber pressure of 75 psia (to 375 psia) and an estimated thrust of 310 pounds-force with a burn time of 13.5+ seconds. The vehicle was transferred to the MTA’s sixty-foot launch tower and the payload prepared for flight. 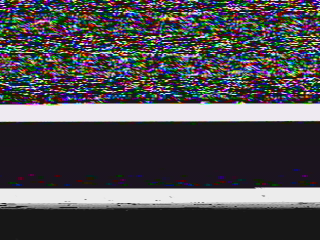 The payload included an RDAS fight computer with 3-axis acceleration logging and a separate video camera and MicroTek, Inc. transmitter (Figure 9). The recovery system used 1000 psia Helium to pressurize the parachute compartment via a pyro-valve and force the payload away from the vehicle. One-half hour before flight a sounding balloon was released and tracked to 80,000 feet with wind drift of just over 10,000 feet: atmospheric conditions were extremely calm with no significant winds up to the 24,000 foot maximum potential altitude of the vehicle. As mentioned previously, because of the vehicle’s relatively low thrust-to-weight ratio a single strap-on rocket was attached to the rocket directly opposite the launch rail; this motor generated about 600 lbsf. thrust for about 0.5 seconds and was designed to burnout about 2/3 of the way up the launch tower. The strap-on was also designed to separate from the Peroxide rocket at the top of the launch rail. The vehicle was filled with 42 pounds of 85.5% Hydrogen Peroxide (the Peroxide had decayed from 90.5% after nearly one year of storage) that was heated to 137 degrees Fahrenheit at the beginning of fueling (Figure 10) to assure a smooth start up despite a “cold” catalyst bed. Note that 90% Peroxide will auto-decompose at 140 degrees Fahrenheit; this procedure is not recommended to those not fully familiar with Peroxide; in the event, the propellant was actively bubbling as fueling began. Upon completion of fueling the propellant temperature had dropped to about 130 degrees. The vehicle was sealed and armed (Figures 11 & 12) and just before beginning pressurization the payload electronics were turned on; good video was received at the ground station. Because of the considerable danger associated with this vehicle, all personal were evacuated to the MTA’s “tracking” area at a distance of 1000 feet with the exception of a few who stayed undercover (and specifically at their own risk) at the concrete reinforced bunkers 100 feet from the vehicle. Following pressuration to 4300 psia (the 6000 psia bottle had been used the previous day for the third static test and didn’t quite have enough gas remaining to reach full pressure) and separation of the quick disconnect from the vehicle a 10 second countdown was followed by liftoff. Observing from 15 feet away inside the Blockhouse it was immediately obvious that the solid strap-on had not ignited (Figure 13). 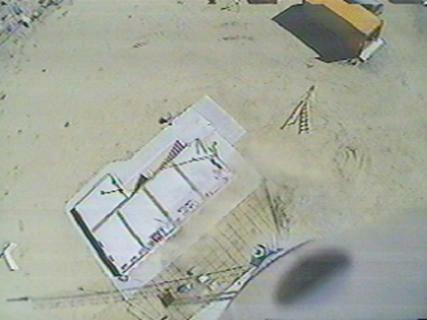 As seen from the tracking area, the vehicle cleared the launch tower with the strap-on still attached (i.e., the separation system failed); at about 80 feet altitude the solid ignited (Figures 14 & 15). Figure 8: Third Static Test. Internal thrust structure and the Fill /Drain Valve can be seen through the open side of the vehicle above the fin can. Figure 9: Payload showing Camera, RDAS 2-Axis Board, Antenna assembly, and Pressure Tanks. The on-board video fully records this sequence due to a low sun angle and the shadow of the tower and vehicle being fully visible in the video. 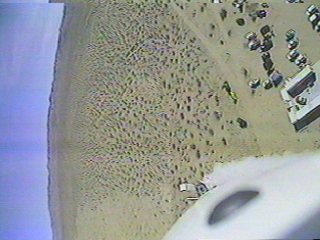 As seen in the flight video and from the tracking area, the solid rocket pitched the vehicle about ninety degrees so that it was flying horizontal and pointed downrange (Figure 16). At this point an unidentified upsetting torque (the solid rocket motor thrust was starting to taper off) caused the vehicle to pitch vertical and begin climbing for about one second before again pitching sideways and starting to accelerate horizontality and downrange (Figure 17 & 18). The vehicle continued to rapidly accelerate parallel to the ground to near an estimated Mach 0.6 before gravity turning downward and impacting at about 11 seconds (Figure 19). Following impact a cloud of Peroxide vapor was seen and the fire crew ran to the site. At the impact site no useable part of the vehicle survived; the impact hole was smoking (peroxide vapor) and the remains of the high-pressure tank hissing as gas escaped: a genuine “smoking hole in the desert”. Applying the standard RRS flight vehicle recovery system (a shovel) resulted in a fire; subsequent analysis indicates that this was due to destruction of the Lithium batteries used in the payload: these batteries ignited upon exposure to the atmosphere. Covering them with earth quenched the fire. The nose fairing appeared to have disintegrated on impact and the payload was found about two feet into the desert floor. The High Pressure section also disintegrated excepting the High Pressure Tank, which shot away and came to rest about eight feet from the impact hole. The regulator was found inside the impact crater but the remains of the propellant tank were found about ten feet away near the High Pressure Tank; the Propellant Tank remains were little more than a nearly flat piece of Aluminum. The Motor and Fin Can were at the top of the impact crater; the Fin Can was split open and the Motor badly bent at the thrust ring and on the nozzle. A few pieces of the Fill / Drain and Main Propellant Valves were found. The liquid rocket appears to have performed correctly under very off-design flight conditions. Available data indicate the entire system functioned according to plan and was accelerating the rocket as it turned into the ground. Based on the flight time and the small peroxide cloud following impact, it appears that thrust (and burning time) were about as expected following the pre-flight adjustment of the regulator output pressure. Figure 10: Fueling for flight. 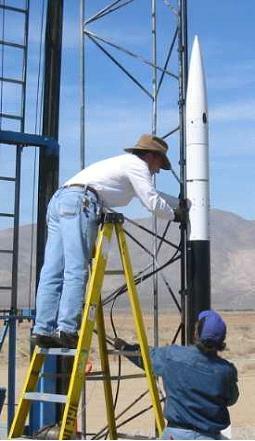 Note the use of a peroxide-compatible sight tube to determine propellant level. The failure of the solid strap-on to ignite on the pad was expected: the rocket was powered by a KNO3 / dextrose propellant that is known to have a significant ignition delay. In consequence, a hold down bolt had been developed that would hold against the thrust of the main liquid motor but break when the solid hit full thrust. This system was not installed due to the very calm flight conditions and concerns about inconsistent results during testing of the hold down; the expectation that the solid would separate at the top of the tower influenced this decision. Figure 11: Attaching the high-pressure Quick Disconnect to the vehicle during arming. The reasons for the failure of the separation system are less clear; post flight analysis–and the on-board video–indicate that both of the “belly bands” used to guide the vehicle up the tower were still attached to the vehicle at impact. 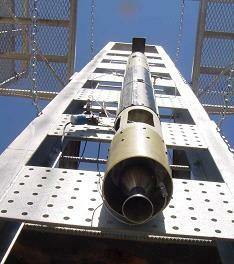 However, inspection showed that the separation mechanism had operated as planed with the pin holding the belly bands in place having pulled before impact; it thus appears that the two belly bands were held to the vehicle by some other force, possibly associated with twisting of the bands during acceleration up the tower. No post-flight analysis is complete without some lessons learned, several of which came out of this effort: The carbon fiber airframe tube for the Propellant Tank was unnecessary, a standard filament wound fiberglass airframe tube would have been sufficient. The need for a strap-on booster could have been avoided with a higher thrust main engine, if one were to attempt this project again then something in the 500 to 1000 pound thrust range would be a better choice. The fins were oversized to the needs of the vehicle due to use of a commercial but hobby oriented CFD software program that incorrectly predicted sub-sonic center of pressure; fins about 7” in length along the root cord, extending 4” out into the air stream and about 3” in length along the edge would have been sufficient and would have saved both weight and drag. Further development of the “belly bands” for taking the vehicle up the tower is required, particularly if they are also used to mount a booster rocket or rockets. On-board video proved to be mandatory for understanding the dynamics of the flight; this is a powerful data analysis tool that should fly on any complex project. Addition of a GPS “overlay” to the downlink would provide a redundant set of position information at low marginal cost (compared to the project cost). Finally, mounting of an accelerometer–based data-logger inside the Fin Can (with appropriate heat protection) might have provided a “survivable” second set of flight data. Figure 12: Vehicle just before closing the propellant tank vent. Note solid strap-on rocket at base opposite the launch tower. single liquid rocket; further, such solid rockets would have offered higher performance and much higher reliability. 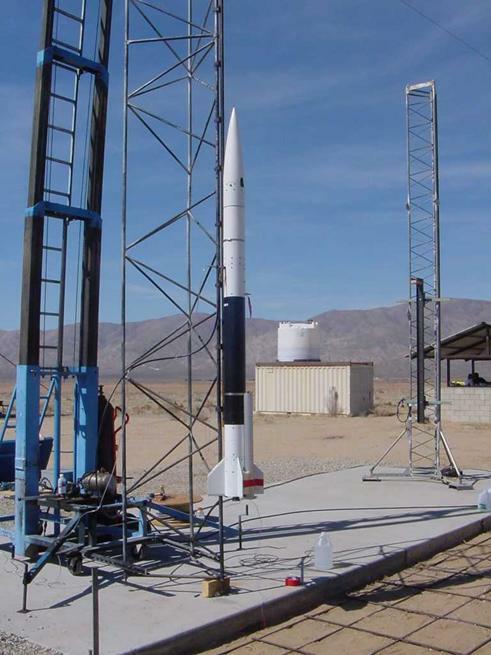 Even after allocating some of the cost to learning it is difficult to justify ever taking on another liquid rocket project: they are simply too complex, too costly, and—although the liquid rocket potion of this effort actually worked—much too likely to fail (due to complexity) when compared to similar sized solid rockets. Rationality, however, is not the only reason we humans do things: the view that one finishes what one starts had a lot to do with getting this vehicle into the air. Nor can it be overlooked that others contributed mightily to the effort: George Garboden, in particular, should be single out for his nationally recognized expertise in Hydrogen Peroxide rocket motors and steam generators; this effort would have utterly failed without his guidance, help, and remarkable good humor. Likewise Dave Crisalli arranged fabrication of the propellant tank and served as the launch conductor; his encyclopedic knowledge of liquid rocket testing served to avoid a host of potential disasters. 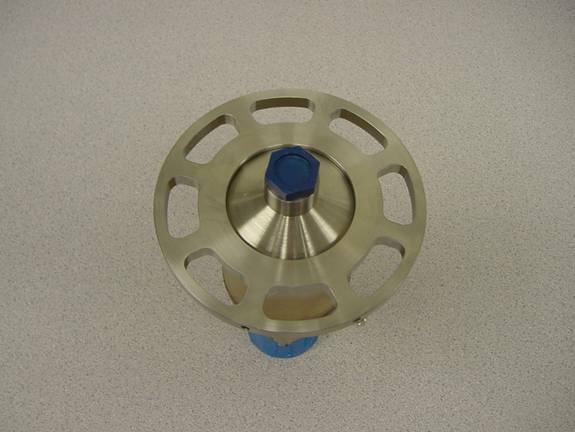 As previously mentioned, Tom Muller designed and fabricated the main propellant valve and associated pyro-valve. Kevin Sagis contributed winds aloft data and a 6-DOF trajectory analysis on the day of launch; Adam Uhl designed, built, and tested several strap-on motors, including the flight motor. All of which speaks to the ultimate purpose in an effort such as this: the opportunity to share a glass of fine champagne on a desert evening in the company of the very best of friends. Figure 13. Smoke Ring: Liquid water formed during start-up makes a ring-cloud around the base of the vehicle a fraction of a second after lift-off. Figure 14. 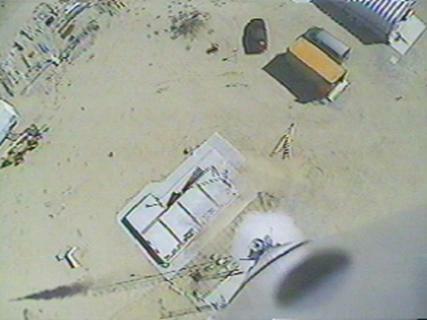 Clearing the Tower: The ground shadow image shows the vehicle has just cleared the 60-foot launch tower. 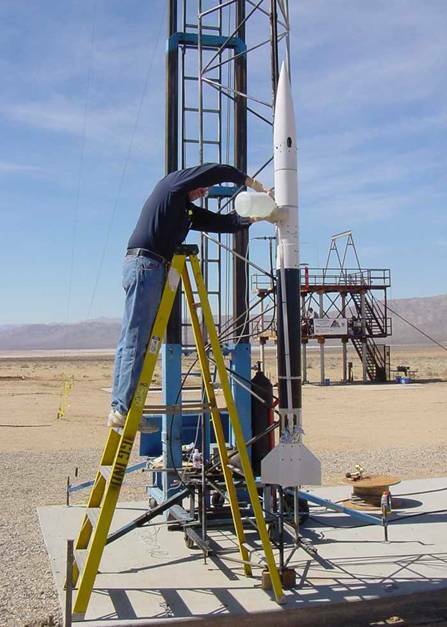 The Strap-on rocket–which should be separating–is still attached to the base of the rocket. The Blockhouse is visible directly below. Figure 15. Strap-on Ignition: Still attached to the vehicle, the strap-on solid rocket ignites as seen in the ground shadow image as well as directly below the rocket. Figure 16. Power Turn: The vehicle rolls 90-degrees right and pitches 90-degrees in the downrange direction due to the asymmetric thrust from the still attached strap-on. Figure 17. 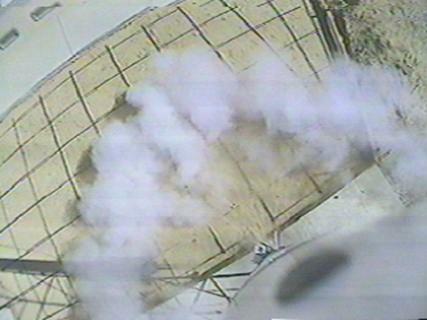 Accelerating Downrange: Continuing to roll, the vehicle heads downrange under power at about 200 foot altitude; the original image shows the image distortion around the base of the vehicle caused by the exhaust, indicating the rocket is under power. Figure 18. Last Ground Image: Showing some of the infrastructure at the MTA, this is the last image showing dirt before the vehicle begins a gravity turn into the ground. Figure 19. Crunch. 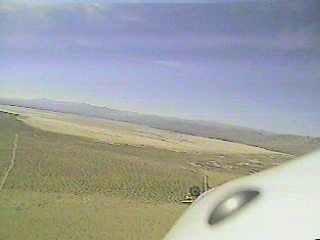 Impacting at around Mach 0.6; the image suggests that the video feed from the transmitter first failed at the antenna but may have then briefly shorted to the vehicle resulting in the lower portion of the last received “image”.